The dryer won’t start? Does it make a lot of noise? Leave any problem to our specialized dryer technician in Whitby. Trust our quick response and repair expertise. 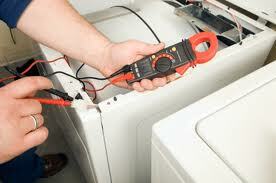 We are equipped to troubleshoot dryers and diagnose their problems on the spot. Our tech will do what is required in order to fix a problem. On top of dryer repair service in Whitby, Ontario, we also offer installation and maintenance. Why call our dryer technician for services? Your top load dryer might not be the most complex home appliance, but it still needs proper servicing. From finding the reasons for the dryer not starting or heating properly to actually fixing the problem, every step of the service requires experience and the right equipment. Installing a new dryer correctly is also important. If the appliance is not connected properly, it won’t perform right. Don’t forget that each model has different specs. You might own a front load washer and dryer or an independent dryer. In order to service, fix, and install it, you need to do the job by the book. If the appliance is not serviced or set right, it won’t perform properly, might waste energy, or even start a fire. The dryer technician, who will come for services, will be knowledgeable, well-equipped, and qualified to do any required job. We are all updated on our team and fully trained to service dryers regardless of their type, model, and brand. Want quick dryer service? Call us and one of our specialists will come to address the dryer problem in no time. If the problem is urgent, our company offers same day repair service. Need dryer installation service? Always depend on our team to do an expert work. When it comes to scheduling the installation of your new appliance, rest assured that we are flexible. Want a tech to maintain the dryer? You can still get in touch with Appliance Repair Whitby and expect outstanding service. We are meticulous in order to ensure excellent dryer operation and prevention of problems. We can do any job related to your dryer. From installing to fixing it, you can always turn to our Whitby dryer technician. Call us today if you want to schedule a service.